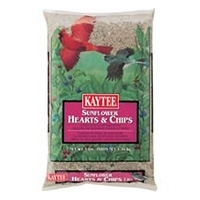 The pre-filled Kaytee Sunflower Hearts & Chips Feeder makes it easy to attract finches, woodpeckers, nuthatches, and chickadees to your yard. These birds truly enjoy sunflower hearts and chips and are very comfortable perching on the mesh material. Simply hang up the refillable feeder, and enjoy the color, song and beauty of songbirds in your yard! Recommended for wild birds.